My grandmother, Mildred, was born in Sioux City, Iowa, in 1902. She died in Windom, Minnesota, in 1974. During the 71 years of her life, Grandma moved frequently, particularly during her youth, as she was the daughter of a Methodist pastor. Moving within Iowa and then to South Dakota, the family uprooted in 1904, 1905, 1907, 1908, 1909, 1911, 1915, 1917, 1920; three younger siblings were added to the family at various points in the geographical shifting. Because of childhood illnesses, Grandma’s schooling took longer than it might have. After graduating from high school in 1922, she attended Drake University for four years. In that time, her parents moved twice. Once she had her degree, my grandma taught, took more courses, and traveled, in the process relocating at least seven more times. Eventually, in 1933, she married my grandfather, Julian, and they started their own family, living out the rest of their years in small-town southern Minnesota. Sitting here, decades later, I try to imagine her life, as it must have felt to her. It’s impossible to know anyone else’s experience, of course; even as we live out our own days, it’s often incogitable to understand events as they’re happening. In the moment, it just is what it is, with perspective being the benefit of time and a larger sprawl of context. For my grandmother, frequently changing house for the first part of her life was the norm. She was a kid. When her parents announced, “We’re moving to Smithland (or Castana, Presho, Tripp, Armour, Henry, Salem, Doland, etc. ),” Mildred most likely shrugged, looked for her favorite doll, and strapped on her shoes. Later in her life, after she married and therefore stopped moving every year or two, how did that feel? Again, was it just “what it was”? Or was there a sense of shifting gears, of enjoying being settled, of chafing at being settled? Did she ever find it dull to wake up, year after year, in the same rooms, talking to the same people? Or was that something she’d always craved? Then again, even when her family moved frequently, she was always surrounded by the same people: her parents and siblings. Thus, in a way, she’d had stability in the midst of change. In that way, perhaps being settled felt the same as moving. Even in the recordings of Grandma’s life events and in the notes my mom and Aunt Geri took when they questioned her about her memories, the emphasis is on dates and places, with anecdotes mixed in–undoubtedly, the focus is on the what more than the why and how. We know such-and-such happened, but we don’t necessarily know how my grandmother felt about it or what the motivating factors were. Why, for example, did Mildred’s mom and dad take a claim 15 miles outside Presho, South Dakota, in 1907, live in a tent and tar-paper shack for 16 months while building their “house to retire in,” and then move to Tripp, South Dakota, in 1908? I can’t help but wish for the story behind those numbers and place names. Ultimately, when we look back on the lives of our forebears, at history in general, it’s all piecework–taking this tidbit and that chunk and laying them out in a pattern that makes sense, given what’s at hand. We stitch the names and dates together with words, speculation, recollection, and possibility. Then, when all the tidbits and chunks have been stitched together, there is a story. Someone else might look at the same tidbits and chunks and, in the creative process of making decisions, stitch them together into an entirely different story. Again, my grandmother provides an illustrative example. 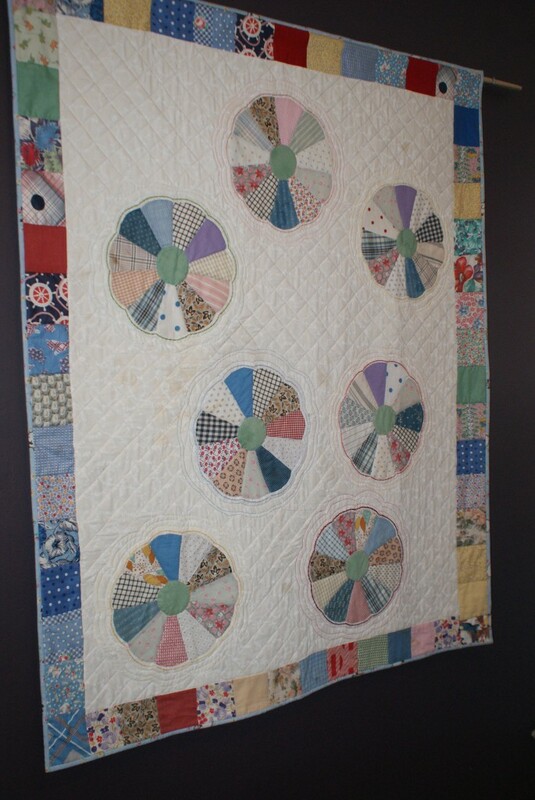 After she died in 1974, when her children were sorting through her effects, they found a quilting project she had started: a stack of circles in the classic quilt block pattern known as Dresden Plates. The fabric in the quilt blocks and rectangles she had cut for borders were scraps of Mildred’s old house dresses–as my mom explains, “That is, dresses for staying at home and doing household chores or going down the alley to visit a neighbor lady and taking a few cookies or whatever–often with an apron over the dress. There are no Sunday-go-to-meetin’ fabrics” in the quilt. Supplementing the material from her house dresses were bits from blouses, aprons, soft toys, and fabric from a church rummage sale. Before she died, Grandma had drawn the pattern, cut and sewed the plates (29 of them), and joined together the rectangles for the quilt’s border. 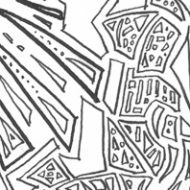 After she was gone, the promise of her project remained, for she had laid out a basic framework, enough that another quilter could pick up the pieces and carry on. Fittingly, the project passed from mother to daughter. My mom, busy living her own life, racking up the names, places, and dates that are the scaffolding upon which a life story is hung, carried those Dresden Plates with her for decades, from one house to the next, from city to the next, from one state to the next. Eventually, she turned her attention to creating four wall hangings out of the plates, one for each of her four grandchildren. In this way, in this manner of fashioning a tangible legacy, women’s handiwork has profound power. Indeed, what doesn’t come through in our handiwork is the why or the how of a life. Someone looking at the quilt can’t see all the years when my mom had the Dresden Plates in storage and felt caught in a marriage that made her miserable. The viewer can’t see how she took a leap toward finding her own happiness when she divorced my dad after almost forty years. There is no evidence of the ripples that decision set off in our family, many of which are still being felt today. A person in the future admiring her tiny stitches will never know that the quilter worked for years in a career that challenged and delighted her at the same time it exhausted and stressed her. Those considering the fabrics used will never know that the quilter used to turn somersaults in the hallway with her three young children. 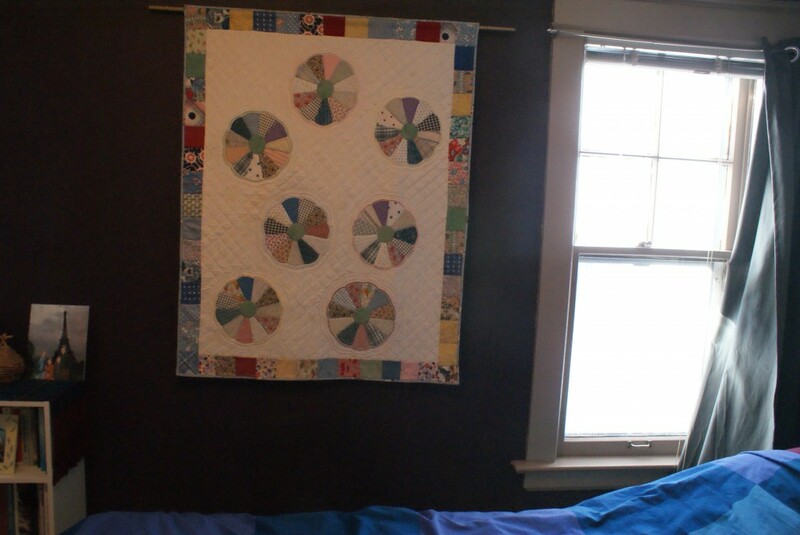 As they admire the contrast between circles and rectangles, they will have no sense that the quilter was not a sports fan but, nevertheless, worked as scorekeeper at her son’s baseball games. She loved donuts, sometimes to the point of hating herself. She loved to travel, to talk about books, to ring bells. She wished her hair weren’t so thin. She discovered, when she was 79, that she could do push-ups. All of those small moments of life can’t be seen in a quilt. All we can see is the work, the craft, the diligence and creativity. I felt chills when I read the part about your mother and her divorce. But everything got to me–the quilts your kids will never quite know the way you knew them as you don’t know them as your mother did nor did she know them as your grandmother did. That’s the stuff in life that keeps me going. Sometimes I look at things and feel so sad my niece will never know the story behind them. That’s one reason I’m compelled to write. The other being I asked my parents a bazillion questions but never the “right” ones and can’t now. Oh yes the third–I’m vain and…. The need to know can be consuming. I put a lot of effort into learning why the grandfather I never knew married the grandmother I barely knew. Both deserted the children. By the time I cared to know, no one I knew could tell me; I couldn’t find cousins I didn’t know well who might spill. One day I realized, It was what it was. The end. All my research, however, has made me think of Laura Ingalls Wilder in a whole new light.She was your grandmothers! Tough. How perfectly lovely. It makes me wish I had a quilt tended to and handed down across generations. Treasure them indeed. Wow! I’ve never heard of the Dresden plate pattern. 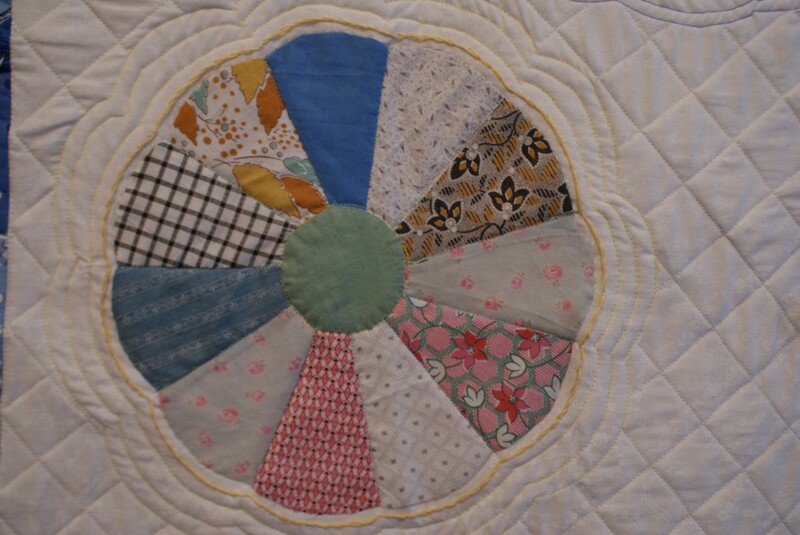 What luck that your mom knew how to quilt and was able to finish it. It seems as though those skills are no longer passed down. I’ve often wondered about the why and the emotional impact of immigration, etc. I think people were taught to repress their feelings, plus they were too busy surviving. Beautiful! Both the writing and the quilt! My mother was a quilter, I have two of them (one of which is almost worn through). You’re right, the love comes through. Have I ever mentioned just how much I love your stories? oh, man. i love that. all of it. Gorgeous. The quilt and the story. I often see things in antique shops and wonder at the story behind them. The quilts, the photos, the kitchen pots and clothing. What would the former owners want us to know about them? Your children are lucky to have such a tangible tie to their grandmother and great grandmother. This is why I have a blog. I want to make sure that my daughter knows who her Mother really was, warts and all. I know so little about my own Mother or hers or my Da’s Mother. All stoic, quiet women who weren’t prone to hearts on sleeves and frankly, all three would be APPALLED by the frankness in my blog. My Mother could often recall the month and year something happened, as in, “Your Uncle Pete was born in April of 1929” but never how she felt about finally having a little brother. I would much rather hear THAT story. Those quilts are almost unbelievably lovely and they do tell a tale. Persistence. A willingness to leave something beautiful behind…..
You need to print this post, make it into an iron-on and then sew it to the back of each of her quilts. My Lord, woman. You brought me to tears. I love it all–quilting is definitely something I would like to do someday. I love this. I found a quilt my grandmother had pieced and quilted it by hand. It is a small quilt and hangs on my wall. I put in some 30,000 stitches to finish it, and then embroidered both our initials on it. Having grown up as the daughter of a quilter I can say this piece speaks to a deep place in me. Words fail, but there are stitches to tell the story. Thank you. I like Green Girl in Wisconsin’s suggestion. A very moving piece about what women can hand down but also what never gets known. I once heard someone say that the best advice any parent can give their child is the example of coping with adversity: for a child to see how it is done, and know that it can be done, is to equip them for life. In many ways, the stories behind these quilts do just that. My god daughter wrote a book on quilting which gives the stories behind the quilters as well as the patterns. Thank you for this. 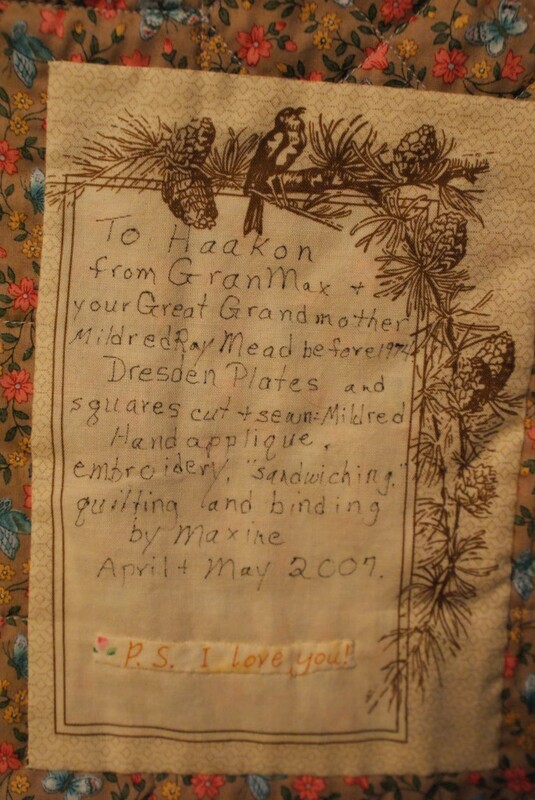 We don’t have quilts in our family but I do have letters from young children written in the late 1700s to their parents, purporting to come from the family dogs:) They are priceless to me and give a wonderful, if tiny, insight into family life then, at a time when one thinks children were more repressed.